Arizona State University President Michael Crow and his wife, Sybil Francis, announced Wednesday a $1.2 million commitment to fund the directorship of the ASU Public Service Academy, a new center created to educate purpose-driven leaders who intend to serve in nonprofits, the civil service and the military. 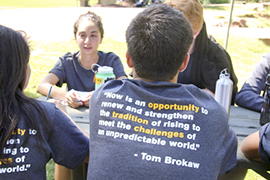 The gift from Crow and Francis, who serves as executive director for the Center for the Future of Arizona, comes as the academy welcomes its inaugural cohort of 100 service-oriented students to their first semester on campus. Crow appeared on several national news shows in New York on Wednesday morning to speak about the gift. “We're building an academy where people will learn practical aspects of leadership and will take their regular major and will have scholarships training side by side with future military officers to produce the new kinds of leaders,” Crow told the “Today” show. “Today” host Matt Lauer praised the move. “How many times in the past have we talked about only really respecting people who put their money where their mouth is? Dr. Crow is putting money where his mouth is, and is personally donated more than $1 million to this academy,” Lauer said. Tom Brokaw also appeared on the show to speak about Crow and his actions. “I'm not afraid of embarrassing him, but everybody regards him as one of the two or three greatest university presidents that we have in this country because he is so dynamic,” Brokaw said. The gift — composed in part from contributions by private supporters to the Presidential Leadership Chair, a fund established to provide ASU with resources to retain and incentivize university presidents — will permanently establish the Michael M. Crow and Sybil Francis Endowed Directorship for the Public Service Academy. The Public Service Academy is embedded in ASU’s College of Public Service and Community Solutions, where Crow is a professor of science and technology policy and public affairs. Crow’s career in public service dates to 1974, when he joined the University Year for ACTION, an affiliate program of the Volunteers in Service to America (VISTA). Similarly, Francis began her career in 1980 as a congressional aide before serving in the White House’s Office of Science and Technology Policy. The new Public Service Academy offers two tracks: Reserve Officer Training Corps, the existing university-based program to commission officers in the U.S. Armed Forces, and the Next Generation Service Corps, an original program for students from all majors to become civilian service leaders. Both tracks include a unique civilian-military collaboration, a series of seven leadership courses and a set of summer internships in nonprofit, government or private organizations. The academy’s director, Brett Hunt — a former captain in the U.S. Army and Foreign Service officer for the U.S. Department of State who was appointed to the Public Service Academy in June 2015 — will be the first to hold the endowed directorship role. He said he is renewed by this generation’s focus on moving the needle for social good — even more than on securing high-paying jobs. A formal launch event for the Public Service Academy is scheduled for early November.